CONCERN: Hello, I was diagnosed with diabetes and we are still searching for a care plan that works. My levels have never been under the mid 200's and are mostly in the high 300-high 400's (as high as 496 several times). I have been put on 30 units of Lantis 1 x a day and 10 mg. of Novalog 3 times a day. I also take 2000 mg. of Metformin each day. I have been sent to the hospital several times to try to reduce the glucose levels as well as for dehydration which is really taking its toll on me. I have severe related issues like hair loss, severe fatigue, severe thirst, balance problems, blurry eyes, etc. I am going to increase the Lantis to 36 units a day in about 5 days. At this point nothing seems to be working yet. I am very discouraged because I only eat sugar free foods and watch every single carb I eat. I am very worried about ketones and even worse problems. I am wondering how dangerous levels in the 400's over a long period of time (months) is for me? I have a new Dr. that is really trying to help but I am losing faith each time I have to take a shot during the day. My thighs (I can't take it anywhere else due to other health issues) are so bruised and tender and I have cried several times after taking the shots. I am sticking my finger at least 10 times a day which is also killing my fingers. They hurt even as I type this. What are my odds of actually getting some hair growth back? I know it sounds vain but I am a 38 year old woman and this makes me VERY uneasy. Any help, words of advice ect. is most appreciated. First of all, I am really sorry for your condition. However, you should never surrender: Gamble all your strength and continue your long battle against diabetes. In this battle, eating the right diabetic foods is not the only solution. Physical activity is also important. Simple exercises like walking at least 30 minutes per day; or any other relaxation exercise help you manage your condition. Try to go out, and be close to nature: picnics, parks, beach, mountain. Physical activities if made near Nature, make you breath fresh air, and clean your body and feel fresh and rejuvenated. And drink plenty of water, no other juices (at least until your blood sugar are stabilized). 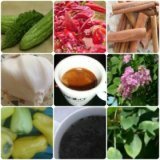 If you have visited the Natural Cures for Diabetes page, and if you have type 2 diabetes, there are some herbs that really works to lower blood glucose levels. I gave a mixture of these herbs to my late father, and he was enthusiastic that his blood sugar level was stabilized; although he used to "break" his diet sometimes due to his gluttony and ate the "forbidden" foods. This was my father's experience; different diabetics have different experiences. Thinking about the worst will cause you stress. Stress will raise your blood sugar levels. And here you are; closed in your own circle. And if you're worried about your hair loss caused by diabetes; don't be. Think how beautiful and wonderful you're inside. That beauty will shine outside and you still remain a beautiful lady. (And if you still feel uneasy about hair loss, just wear a scarf as you're defining your own mode, or wear a hairpiece till your problems will solved). Remember: you're beautiful, because you're a human, you thing, feel, love, jump, swim. Think of how many people cannot jump or walk; how many children are injured from their parents mistakes. You have the chance to live without all these problems. But, you're diagnosed with diabetes. Follow the diet strategy and good lifestyle habits and be close to your doctor, and you'll get your blood sugar coming down again. Get a smile now and each time you get a shot, pray God it would be the last and pray you could be much more stronger. My mother is having a difficulty time controlling her blood sugars. She takes 80 U of lantus, and apidra, she doesn't watch her diet like she should but a lot of times she will have a bowl of soup broth for lunch and an egg for breakfast. Lately her blood sugars are going above 500 and it does not seem like anything she does helps. (she was checked for a bladder infection it was negative) over time. Is it common that the usual dose of insulin no longer controls or lowers someones blood sugar? I have gone through the medical history of your mother carefully and understood your concern. - she is not watching her diet. If you change the dose of lantus or add another medication, and if she keeps not watching her diet; unfortunately, she cannot bring her blood sugar down to normal range. You should work with her; convince her that diet is the most important part in managing diabetes. If she eats more than her diabetic diet menu, her body cannot digest and utilize glucose properly. Therefore, excess of glucose will keep flowing in her bloodstream. - another medication should be added to her therapy schedule: Perhaps Lispro human insulin to add during daytime. - Combination with oral hypoglycemic agents is also recommended especially when it comes to metformin and sulfonylurea combinations with insulin. Discuss this further with her caring doctor.